Dia De los Muertos, or the Day of the Dead is the most important religious and cultural festival in the Mexican calendar. Not to be confused with Halloween, this is a time of celebration, where lost loved ones are honoured and their spirits are welcomed home. What is the Official Day of the Dead? When is it? What is The History Behind The Day of the Dead? What Does Day of the Dead Symbolise? What Does the Skull Mean in Day of the Dead? 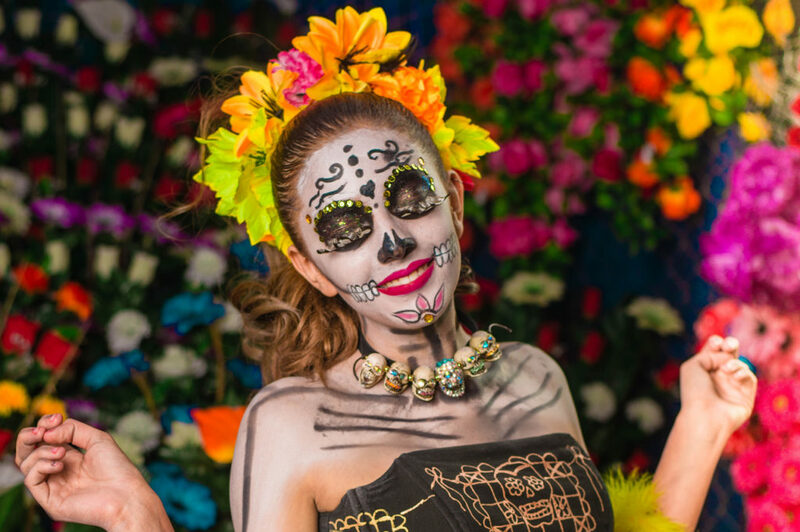 Where is the Best Place to Celebrate Day of the Dead in Mexico? The Day Of The Dead is about so much more than sugar skulls, creepy face paints and lively street parades. It is, in fact, a deeply important part of the celebration of life (and death) as practiced by the good folk of Mexico. Dia de los Muertos as it is officially called in Spanish, is a day to reconnect with the dead, without being morbid or creepy. By using brightly coloured decorations, and organising parties and community events, families pay their respects to their lost loved ones, bringing life back to those who have gone before them. This uniquely Mexican holiday runs between October 31st to November 2nd. The Day of the Dead is actually a direct continuation of ancient Aztec rituals that were put in place to honour those who had died. Way back then, the dead were buried close to family homes in order to maintain spiritual ties with them even after they had deceased. As the Spanish brought Catholicism to the Mexican mainland, with them came their practices of celebrating All Souls’ Day and the later All Saints’ Day. Over the years, the beliefs and customs became entwined and the Day of The Dead as it is celebrated today, was gloriously brought to life. Those who celebrate this special time of year, base their belief on the idea that spirits return to the world of the living for just one day a year to be close to their families. It is written in their history that the spirits of babies and angels arrive at midnight on October 31st, while the adults spirits arrive the following day. Mexico has always had a somewhat different relationship with death, and rituals that Westerners may consider to be vulgar, bring peace and comfort to a nation that does not fear death, and one that considers their ancestors are not gone, but simply existing on a far higher plane. You’ve seen them right? Those brilliant decorated skulls that have come to represent everything that is Dia de los Mertos? From candies to decorations, face paints to tattoos, those multi-coloured skull faces are there to represent life in the face of death. Based upon the La Catrina, the “grand dame of death” or “the lady in the hat” this female skeleton is dressed to impress. Harking back to the Aztec Goddess Mictecacihuatl (Mitcal) – Queen of the Underworld, who was said to protect the bones of the dead, the Mexican skulls faces are designed to be anything but scary. Originally, the lady with the fancy clothes and a skeleton’s face, was portrayed by the famous Mexican artist José Guadalupe Posada as a satirical take on Mexican native who the artist believed were aspiring to adopt European traditions in the pre-revolutionary era. These days though, La Catrina is probably the most iconic image associated with the Day of the Dead festival, anywhere in the world. The Day of the Dead revolves around the creation of an “ofrenda” in the home – a special type of altar set up to help remember lost loved ones. Carefully crafted and lovingly adorned, the ofrenda is covered in marigolds (the official flower of Day of the Dead), sugar skulls, candles and tissue paper banners called papel picado. Sometimes a path of flowers is laid at the base of the alter, to help the spirits find their way home. The deceased’s favourite food and drinks, as well as treasured photos are usually also added. In more traditional homes, the top tier of the alter is covered with crucifixes and images of saints that are particularly important to the family. The Day of the Dead is a family celebration that involves plenty of food. Pan de Muerto (bread of the dead) is shaped to symbolise tears and bones, and baked to perfection to be shared between the family members, either at home or by the graveside of their lost loved ones. For those with a sweeter tooth, candied skulls can be found everywhere and a special dessert made from pumpkin – Calabaza en Tacha – is also a popular sweet treat during this time. On the altars themselves, Tamales are made to entice the adult spirits home, and these are often served with spicy chilli mole sauce. It is also not unusual to see steaming cups of champurrado (a sweet, thick hot chocolate) or even traditional liquors like tequila set out for both the living and the dead to enjoy. If you want to see a real Dia de los Mertos celebration that will blow you away, head to any of these town and cities to see how they celebrate in style. Island life has never been more enticing than when the festival reaches the lake island of Janitizio. 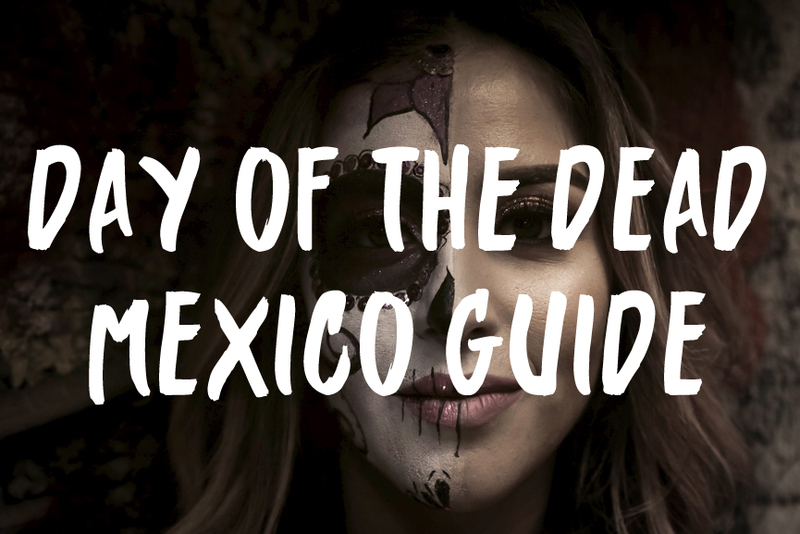 Locals and tourists alike join together to celebrate the spirits return in a truly authentic Mexican way by arriving on candle-lit boats to leave food, gifts and orange marigold flowers at their relatives’ graves. While you are here, watch out for ‘butterfly’ fishing, a traditional fishing method still practiced in the early hours of the morning. 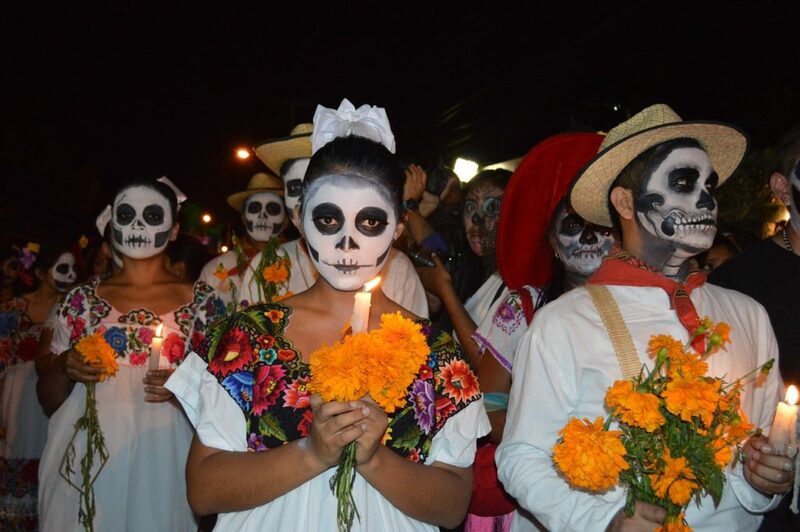 The town may be small, but its Day of the Dead celebrations are anything but. Considered to be one of the very best places to celebrate the festival anywhere in Mexico, the four-day festival is one big party, that is thrown to promote and preserve the ancient ways. This little town really knows how to celebrate, and during the Dia De los Muertos festivities, it pulls out all the stops. The city celebrates with impressive sand sculptures and ofrenda competitions, while the cemeteries are beautifully illuminated with thousands of candles and gravestones are lovingly decorated by friends and family members. The ciudad really knows how to bring the party to life as celebrations are held in parks, churches and even the streets throughout the duration of the festival. The spirits are welcomed with their favourite food, drinks and the music they loved the most during their life. In Mixquic, just outside the city, the main event is the Alumbrada – the illumination of graveyards with thousands of candles. Houses will be dressed with stars and crosses on their front doors to guide the souls home, and during the Hour of Campanera the children ring bells and ask for candy. In Mexico’s largest second city, the tequila flows and the mariachi music plays, as locals welcome back the spirits of their lost loved ones. The Catrinas are said to flee the city when the dead return, so relatives visit the cemetery to see the spirits in with open arms. In the Panteón de Belén cemetery there are night tours and special plays during the day. 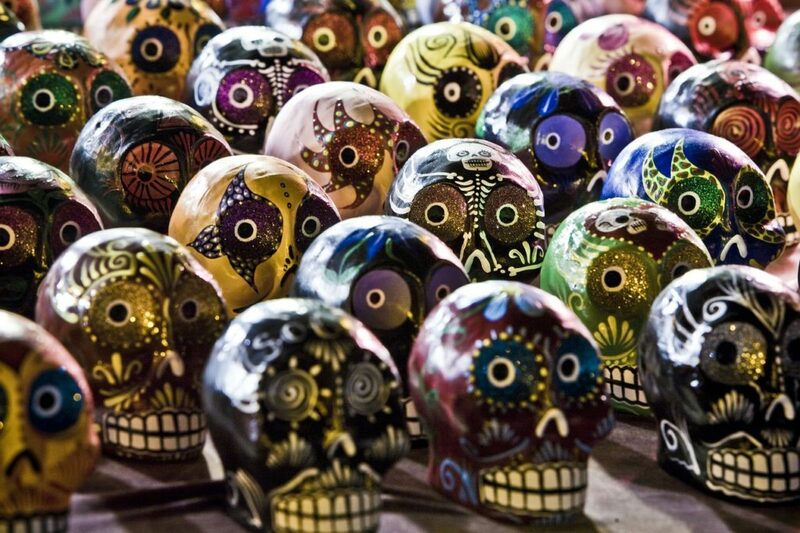 Learn a little about the Day of the Dead celebrations before you travel. This is not Halloween, and locals will not appreciate you turning up looking like a Zombie, banging on doors and demanding candy. While there is a celebratory side to the festival, it is not a 4-day binge at the expense of the dead. Most Mexicans also dedicate a lot of time to cleaning up their loved ones gravesides, playing old music and telling their favourite stories. Religion is a key factor in the way many Mexicans celebrate. While bringing back the dead may seem juxtaposed to western religious traditions (although the resurrection isn’t that far removed if you think about it), there will be prayers and worship, and this part of the festival must be respected too. 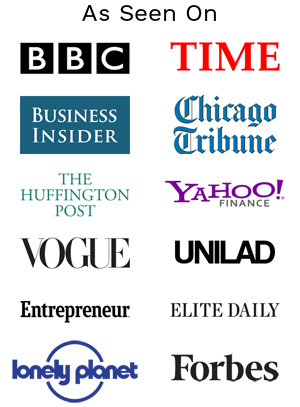 Logistically speaking, expect it to be busy – everywhere! While some parts of Mexico are famous for their own epic celebrations, every village, town and city will usually have some form of festivities taking place, and friends and relatives will travel to be together. 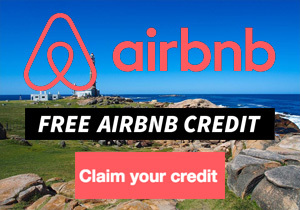 Book your flights, buses, car hire and hotels well advance or prepare to face disappointment. It is not celebrated on the same day as Halloween. While the festivities may start on the 31st October, the main event is traditionally celebrated on 2nd of November. It is not the Mexican equivalent of Halloween. Again, while the dates may be similar, the Day of the Dead is about honouring and celebrating lost loved ones, and not about dressing up as ghosts and ghouls. In Mexico, it is even more important than Christmas and is the nation’s biggest religious holiday. Cleaning is a big part of the holiday as Mexicans partake in a ritual cleaning of both the gravestones of their loved ones and their homes before the spirits are said to return. Flowers are used to attract ghosts back to earth and the Cempazuchitl, or Mexican Marigolds, are the official “flower of the dead”. The Monarch butterflies that swarm parts of the country during early November are believed to be returning ancestors. Pan de Muerto is a special sweet bread that is decorated with strips of dough to look like bones, baked especially for the festival. Spending the night next in a cemetery is a popular way to welcome the spirits home. Family and friends surround the tombstones to share food and stories with their lost loved ones. The Ofrenda altars are a key part of the celebrations. They are not built to worship at, but instead to honour the dead, and used to help attract the spirits back during the festival. It is a festival about life, not death. Although the name may suggest otherwise, their ancestors believed that death was part of the journey of life and that with death, came new life. An extraordinary day where the lines between life and death and seamlessly blurred as Chinese Taoists and Buddhists burn paper offerings to signify the things living relatives wish to send to the deceased, and release paper lanterns to help guide the spirits home. Buddhists use this special day to release floating lanterns or light bonfires to help guide the spirits home, while visiting graveyards to pay their respects to the dead. During a period of 15 days, the Cambodians believe that the veil between the living and the dead it at its thinnest. 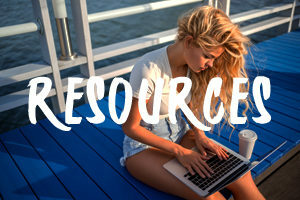 Communities gather together to celebrate and lay offerings of food to the souls of the departed, who are believed to return to earth to re-connect with their loved ones and atone for their earthly sins. Hindu’s also enjoy 15 days of festivities for the dead, when they will say prayers and prepare offerings of food. During this time, believers are not allowed to undertake any new projects, cut their hair or eat garlic. The second Tuesday of Easter is set aside for the Orthodox celebration of Radonitsa, where Easter Eggs are loving placed on the graves of the departed, before picnics are enjoyed beside them. It is traditional to offer gifts to your living in-laws at this time too. Bringing both Christian and Muslim traditions together, Thursday of the Dead is celebrated around the Easter holiday when sweets and breads are handed out to children and those in need. I hope I can visit Mexico during the Day of the Dead. It’s like a Halloween Festival but uses colored and bright decorations. Cool!